After a few difficult but well fought years, it seems appropriate to say that Southern Nazarene football is truly a force to be reckoned with in the Great American Conference. With what is now a 4-6 record, the team’s performance has led to its best season in several years. Better yet, SNU has the opportunity in the coming days to add one more to their win column against their much-anticipated rival, Oklahoma Baptist, whom the Storm have defeated the last two years. While most of the student body is unaware of this, the Storm have had a successful football history, yet not in the years of our generation. Traditional senior students will likely recall their freshman year in which the football team went without a win all year long, and other succeeding students will also recall in the years to follow the next two seasons in which wins were scarce. What makes this year so great for SNU football is its appearance to remain a legitimate contender in the years to come. The wins are part of the evidence of the team’s turnaround, but it is not the only way that it’s seen. In years past, games would often be decided quickly, leading to smaller turnouts and a progressively depleting crowd. 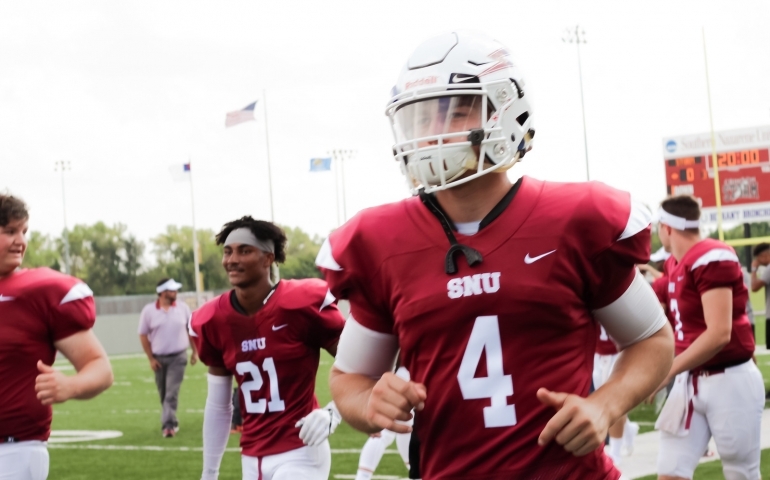 But since SNU has either handled or remained competitive with nearly every opponent this season, there is belief among both the players and fans that the team has what it takes to win every game they play. In fact, in addition to their four wins, four of their losses have only been by at least a twelve point deficit.